Miss G Designs creates one of a kind custom headpieces in her home studio in Los Angeles. Each one is made to order and is completely unique. Owner and designer Caley Johnson speaks about her processes and inspiration. Do you really make every one by hand? Absolutely! Each one is a long and labor intensive process. I do have interns and assistants now, but they help more with the prep work than with the designs or finishing pieces. Thank goodness I have them! It’s a huge help to have an extra set of hands around. I love them so much! 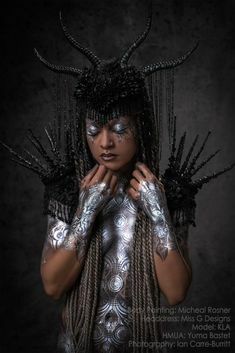 How do you make these incredible pieces? Obviously you have many different styles, but do you have any common practices? There are so many different processes, that there is no one way I make them all. I have no generic process! I will say starting with a good base is very important. If you don’t have a good base how will it stay on your head? So… they do stay on? They look so heavy! They are much lighter than they look! When people try on their new piece for their first time they are always so surprised by how light they are. I put a lot of thought into molding them to different heads, and they usually have a few adjustable straps as well. Some are built more for editorials, and some are made for staying on while you shake your booty. I won’t make any promises if you do cartwheels though! How long does it take to create a finished project? Again, I have no answer…. At any given time I have four to eight half completed pieces. Some of them may be drying while others are waiting for supplies to arrive. Sometimes I just need to take a break from them! They do not always cooperate. I ask for at least a month of lead time with all orders, but of course I occasionally take on rush projects. I live in my studio surrounded by my art… My dining room table is where my assistants make their mess. My guestroom is my storage room, and is stacked floor to ceiling with supplies. I have taken over my entire living room as my workshop. I can’t have people over! There would be nowhere for them to sit down. I’m honestly just happy I have sunlight to work in. In San Francisco my studios were in dark basements and it wasn’t very inspiring. I go through moods. I get bored all the time, so the headdresses change all the time. I don’t know what hasn’t influenced me! 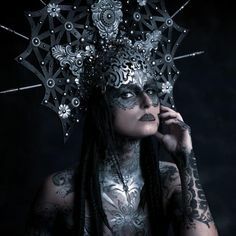 Of course there have been so many great headpieces worn throughout history, and I take influences from Russia, Aztecs, Greek gods and goddesses, and fairy tales. They definitely change with the seasons, for example during Spring I always have a lot of flower headdresses. I love Silence of the Lambs, so I made a bunch of Hannibal Lecter pieces! Are there any designs you will not make? Clients send me photos for specific designs they want, and sometimes they will send me photos of someone else’s work. I let everyone know that I never will duplicate someone else’s work. I can take certain elements and cues from other pieces, but I will always make it unique. 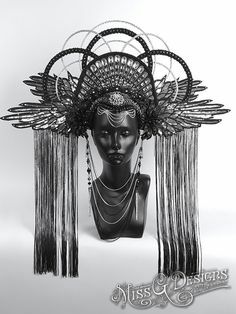 Same with traditional headpieces. I will never try to duplicate another culture’s sacred symbols. Draw inspiration from, yes. Duplicate no. I get asked occasionally to create Native American war bonnets. I am just not comfortable doing so. What makes your pieces so unique? My headpieces are special because my heart goes into every one. They really are my life! I’m a total obsessive perfectionist. My designs must be perfect from EVERY angle, not just from the front and back. If you look through my galleries, I post photos of different angles from each piece so you can see that every view has its own entity. I have so many different styles as well, there really is something for everyone. I am constantly learning new techniques, and I am just as excited by all the things I don’t know yet as I am with what I do know! I love the freedom I have to go in so many directions. I can make anything. That is a blessing.